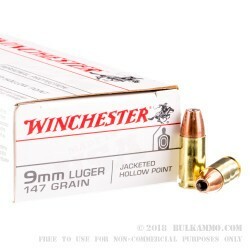 This 9mm cartridge by Winchester sports a 147 grain jacketed hollow point projectile, which is fairly heavy for its caliber. 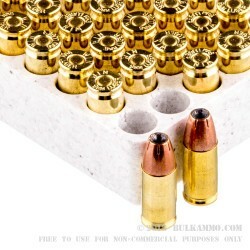 The bullet’s jacket facilitates in penetration as well as feeding in semi-automatic weapons, and prevents the rapid accumulation of lead residue which would impact accuracy over time. It further features notches around its tip, which create fault lines along which expansion can reliably occur. 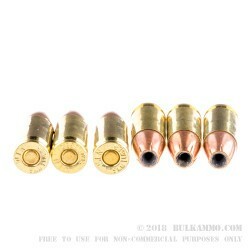 This bullet’s ability to expand to significantly greater than its original diameter makes it suitable for self-defense, as does its consistent accuracy and high energy deposit with its fast muzzle velocity of 990 fps. 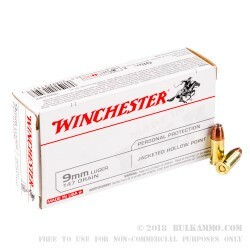 This cartridge further offers a non-corrosive Boxer primed factory fresh brass casing, so you may keep breathing life into this box of rounds at your reloading bench for quite some time. Winchester has made fine firearms and ammunition for the better part of two centuries -- their products are worth every ounce of trust you would place in them. Shot these in some out dated meat from grocery store and they did heck of job on some roast beef! You do not want to be hit in any vital areas with these rounds! They blow a expansion cavity the size of my fist! And on the through and through you have a big exit wound. Good personal defense round if you ask me. And what is in both of my carry pistols!